(Lebanon, Penn.) 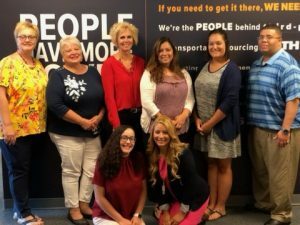 July 25, 2018 – Today, DRT Transportation turned a corner. At noon, all employees in all four offices across the United States stopped what they were doing and listened together as DRT CEO, Rob Kemp, outlined the past, present and future of the company. Generally, in corporate America, when these events take place, the talk is of margins and revenue, goals and objectives and market share. In this, the topic of conversation was the people of DRT Transportation. 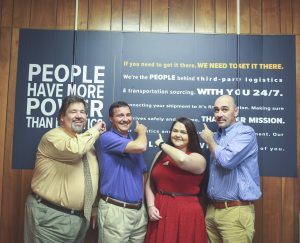 Employees in DRT’s Kingsport, Tennessee office pose in front of the new mission statement. Kemp spoke about DRT’s humble beginnings. 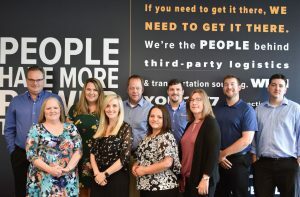 He described the company’s founding in a 200 square foot room, and went on to recap DRT’s growth over the last 11 years to nearly 50 employees across four offices nationwide. “At the end of the day, growth is hard,” said Kemp. “We should be proud of how we’ve grown over the past 11 years,” Kemp continued. DRT’s rapid growth has been astounding, but Kemp and the DRT team are ready to keep pushing and expanding. Throughout his address to employees, Kemp outlined some of the changes employees would be seeing over the next few months, including the new logo, tagline and increased social media activity from DRT. However, the biggest change throughout this process is the rollout of a new company mission and employee rally cry, which calls employees to be agents of change in the logistics industry, in the DRT organization and in their interactions with customers on a daily basis. The St. Paul office gathers in front of the new rally cry after it was unveiled by Kemp. 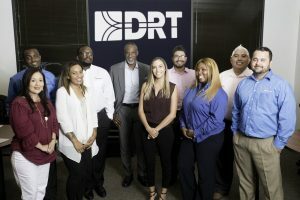 In addition to the new brand elements, DRT also rolled out an employee recognition program for the first time in the company’s history. 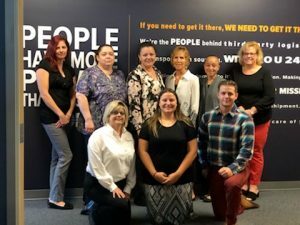 The Dedicated Reliable Teammate Program is meant to bring attention back to the people who are crucial to the logistics industry, and incite excitement and hard work among the employees. A winner will be chosen once a month from a survey that both DRT employees and external clients can access and fill out. This program aims at bringing the four offices closer together while recognizing employees for their constant hard work. Kemp also mentioned an increased presence on social media, in an effort to connect with the public. A second group of employees gather in front of the headquarters mission statement in Lebanon, PA.
“Change is great. It can be hard, but it can be fun,” said Kemp. DRT’s Houston team poses in front of the new logo.